Some control panels are a maze of heavy gauge wiring with heavy expensive DPDT and 3PDT hard to throw toggle switches. In its place SPST light duty toggles can be used working a relay coil which in turn can throw heavy loads and multiple separate circuits. In the drawing for example 3 toggles are shown for simplicity mounted in the panel but as many relays and toggles as needed can be wired in the same fashion. Track power is not even needed in the panel,only relay power so relatively light ,easy to configure 22 and 18 gauge wires are all that is needed. The relays themselves can be mounted conveniently anywhere under the layout. The contacts can switch any load to turn a circuit or multiple circuits on or off with a single, panel mounted or elsewhere, 3 amp toggle switch. For example with a DPDT relay, power to a block and corresponding block signal. An optional circuit for an indicator LED on the panel is also shown in the drawing. For 12 volt relays use a 710 ohm or more half watt resistor. For 24 volt DC relays use a 1200 ohm or more half watt resistor. DC relays are shown using a bridge rectifier for power but AC relays are fine to use also. 18VAC will work a 24 VAC relay coil. Block signal wiring and more information on relays are shown in my post "using relays for 3 rail block detection". By combining relays with timer modules multiple events can be sequenced after a switch is thrown. See my post on Mars timer circuits if interested. Good quality DPDT and 3PDT relays with sockets can be had for $8 each. Instead of a toggle switch 2 pushbuttons can also be used for on-off operation. In the drawing below one set of relay contacts are used to electrically latch the relay coil in series with the NC ( Normally closed) pushbutton. When the NO (normally open) is pushed the relay coil (24VAC shown) energizes and stays on until the circuit is broken by pressing the NC button. The second set of relay contacts is used to switch the load. Also shown is wiring for an LED indictor light,use a 1n4001 diode and 1200 ohm or more half watt resistor. When the layout is shut off then turned back on all such circuits will assume their unpowered state until switched on again by the user. Depending on needs this may or may not be desired feature. 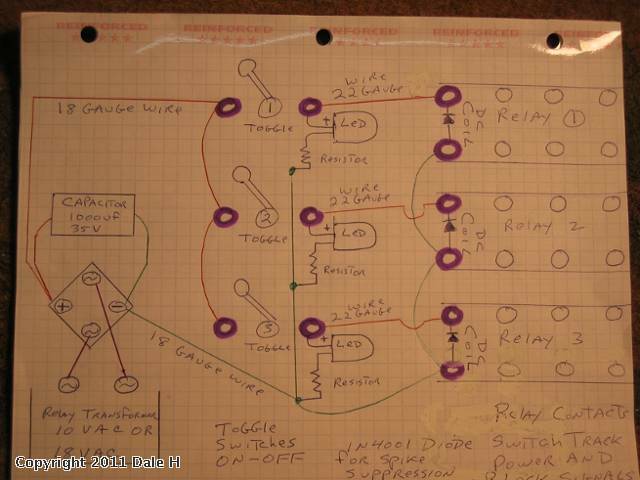 Dale, thank you again for more great electrical information, when I get our new house next spring one of my first projects will be building my dream layout in my big basement. I am saving all of your post. very glad to be of help. Thank you for the kind words.